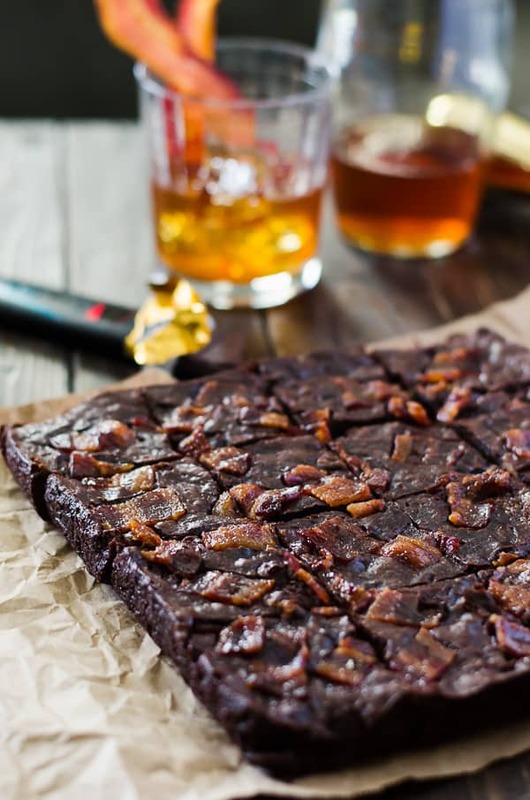 Dark chocolate, walnuts, and bourbon whiskey come together with maple-candied bacon to create the manliest, most decadent batch of brownies you’ll ever eat! 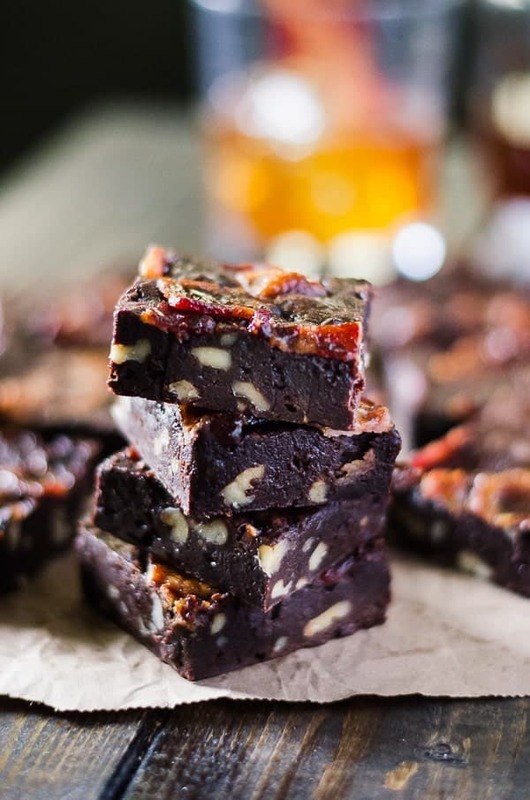 They’re perfect for the men in your life with both a killer sweet tooth and a fine palate! 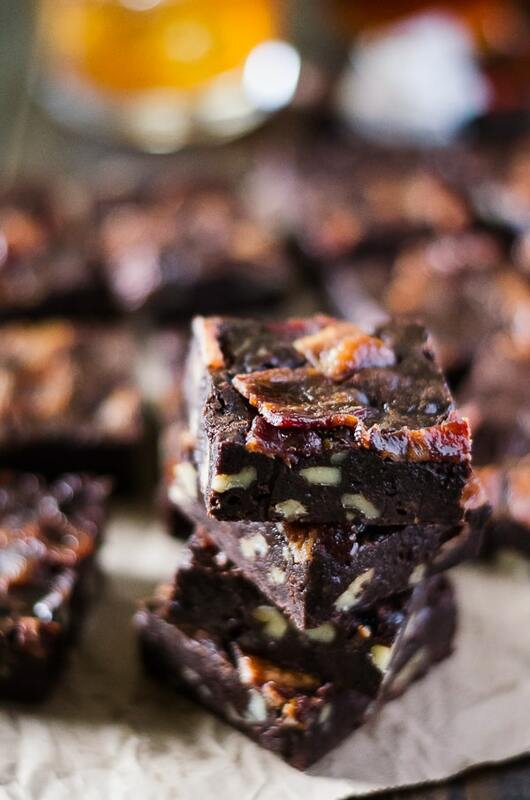 Black Bourbon Walnut Brownies with Maple-Candied Bacon. Of course, that shouldn’t stop any of you ladies out there from eating them. Devouring them, even. Demolishing the whole pan in two days? Completely acceptable. Especially when they taste as good as these do. Lately, I just can’t seem to get my head back in the blogging game 100%. I hoped the Food Wine Conference would help, but work has just been so nonstop, and my need for hobby-type things outside and away from my computer has taken the front seat away from my baby blog. Thought, it’s not so much a baby anymore – The Crumby Cupcake’s two-year anniversary is in a few short weeks! Cue the balloons and party horns. Last year was a full week of recipes, giveaways, and other fun nonsense. Of course, that was my first full year, so it had to be huge. I swear that’s pretty much how I live my life. I am honestly trying to get it together, though. I have a ton of recipe ideas, and I love styling and staging and photographing my food…it’s just a matter of finding the time and energy to make it all happen. It’s been rough trying to keep up with the 3 post a week pace I’ve been aiming for, but I’m thankful that I can at least depend on Sunday Supper to keep me accountable to post once a week! It’s been a blessing having some structure that I don’t have to control when it comes to what recipes I’m doing in a given week. If I’m being totally honest, this week’s challenge put me in a bit of a conundrum. All of the recipes are in honor of dads everywhere, presented a week early in advance of Father’s Day. While I’ve known plenty of great father figures in my 30-some years, I’ve never known my own. It must be a sign of the times when you look back at your childhood and realize you’re in the majority. Though I’ve seen photos, and am in contact with his sister, I’ve never met my dad. But I’ll also never be able to, as he’s passed on. It’s a fact that bothers me more than I thought possible. I actually cried when I found out he had died, and then questioned myself for doing so. How can you mourn someone you’ve never known? How can you feel a hole inside that was left by a person who was never a part of your life? Never be Daddy’s Little Girl. In spite of these things, I’m grateful for the childhood I had. It was difficult, to the extreme at times, but it made me the strong woman I am today. It made me smarter, kinder, more understanding. And I know damn well I’m going to be an amazing mother one day because I’m going to be there. 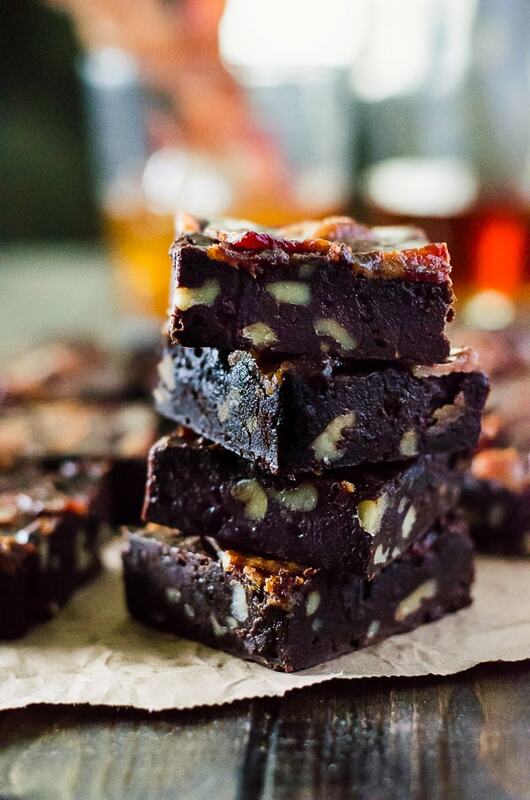 I have no idea if he liked chocolate or walnuts or bourbon, but these brownies are for my Dad. They’re for yours too, and your brothers and sons and uncles and teachers and husbands; any man in your life that’s been there for you, one way or another. Make them, hug them, and thank them. Appreciate all they do for you…even if they’re not around. Preheat oven to 350 degrees F. Line an 8×8 baking pan with parchment or aluminum foil, and butter the bottom and sides. Set aside. Line a baking sheet with aluminum foil, and set a wire rack on top. Place the bacon on the rack and brush the top with maple syrup. Sprinkle on some brown sugar. Bake for 15 minutes, flip the bacon, brush with more maple syrup and sprinkle more brown sugar. Bake for another 15 minutes, or until it reaches the desired level of crispiness. Remove from oven and allow to cool completely, then chop or crumble into a bowl and set aside. In a small bowl, combine flour, espresso powder, and salt. Set aside. In a double boiler (or a metal bowl set over a pot of boiling water,) add butter, cocoa, and sugars. Melt and mix until the ingredients form a batter, about 8-10 minutes. The mixture will still be grainy when it’s ready. Remove the bowl from heat and add the eggs, 3 Tablespoons of bourbon, and vanilla, stirring until well combined. Stir in flour until just combined, then fold in the walnuts. Pour batter into prepared 8×8 baking pan. Arrange chopped or crumbled candied bacon across the top as desired. Bake for 33-38 minutes until a toothpick comes out mostly clean. 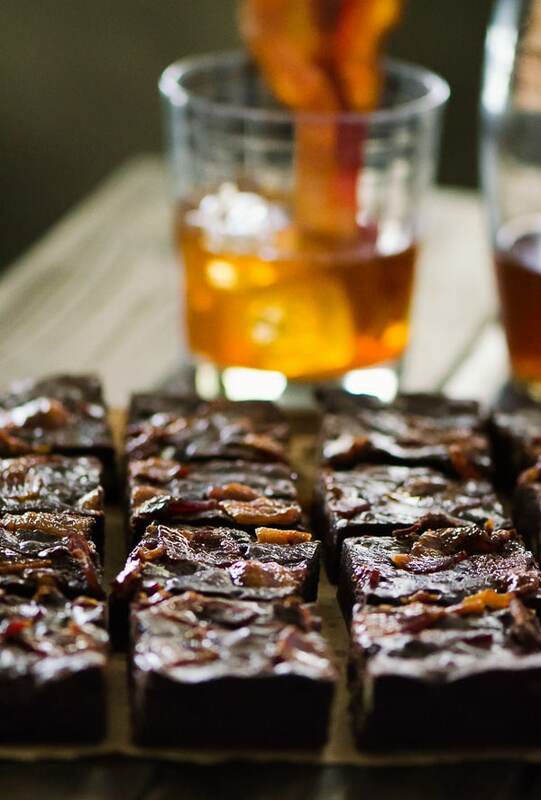 Remove brownies from the oven and immediately pour the remaining bourbon over the top. Allow to cool completely. Cut, serve, and enjoy! You’re going to have a hard time narrowing down which of these recipes to make for Dad, thanks to the #SundaySupper Tastemakers!! My dad would have loved your manly brownies. And so would I! Maple Candied Bacon! Oh my. Sounds just wonderful with chocolate. Beautiful photos. Great post. Happy anniversary BTW. My 2nd is coming up too. This looks AMAZING! Wow! My whole family would love this! I am so sorry that you never knew your dad. I can’t imagine what that would be like. 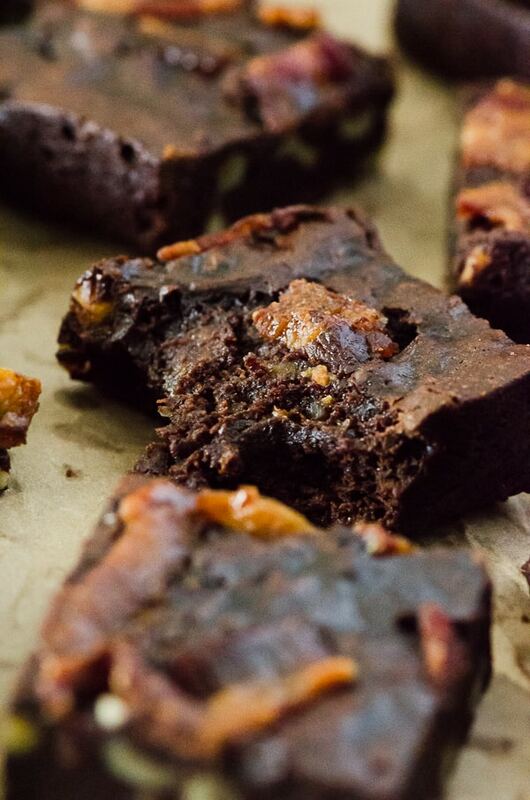 I imagine he and any father, any person, really, would love these brownies. They look almost like fudge. Thank you for sharing something so personal, and I’m sorry about your dad. I adopted my children and my daughter doesn’t know who her dad is, and her birth family doesn’t either. She stays frustrated at the unknown and I wish I could change that for her. It’s uplifting to hear that you took these difficult things in stride and became stronger. 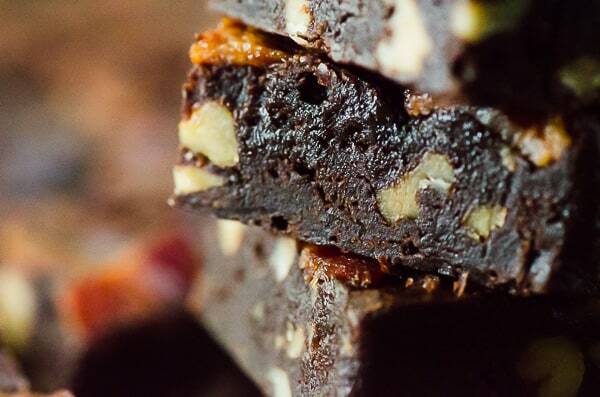 Your brownies look amazing too! This is hard, Erica. I’m glad you have taken a whole lot of negative turned it into a positive. You are wonderful and funny and giving and kind. It was my extreme pleasure to meet you and spend time with you last month in Orlando. You will be the awesome-est of mothers someday. I don’t know your dad either, of course, but I know he is partially responsible for creating a marvelous human being whom I do know. And that’s a great thing for which I am grateful. P.S. Oh, my gawd! Candied bacon! AND fudgy brownies! I’m swooning. 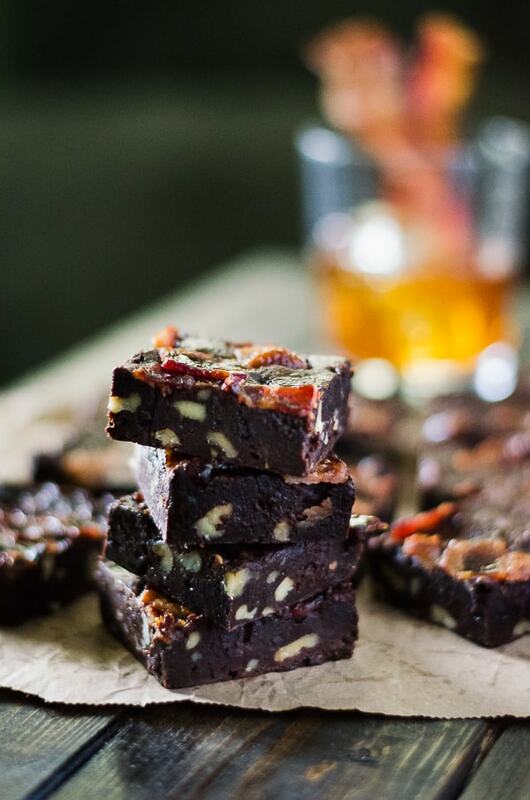 These brownies are amazing – how can you go wrong with bacon, booze and chocolate? these will be one of Steve’s favorites – I can tell already. 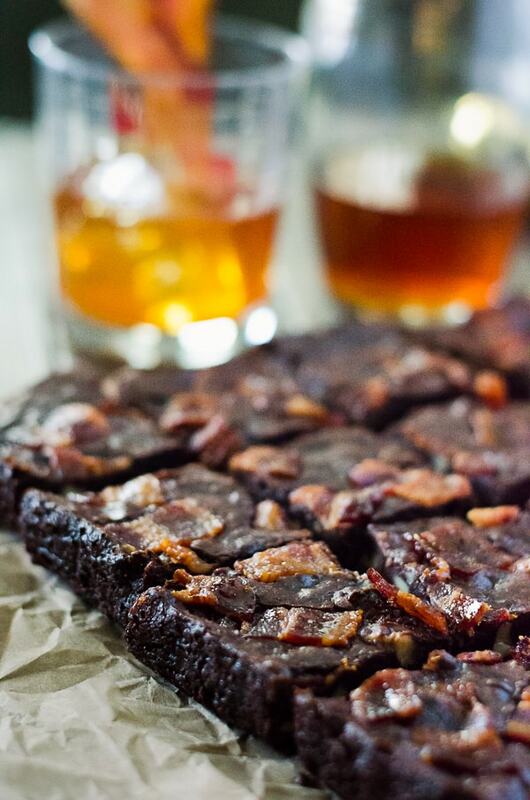 Brownies with bourbon and bacon!! OMG…..